LiveCode LessonsLiveCode LessonsHow To - Step-By-Step Guides To Tasks In LiveCode Working with filesHow do I import a text file? 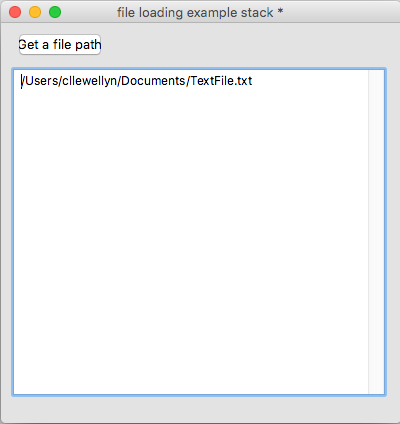 This lesson shows how I create a simple stack, which imports a text file and shows it in a field. When I start a task, I always think about it in a visual way. As I want to show some text, I add a field and name it "text". Then, because I want to do a task, I add a button with the name of that task: "Open File...". answer file "A text file"
But when I tested it, it didn't actually do much, it just showed a dialog, and nothing else changed. The following script does not only get the file path out of the dialogue, it also has some precautions against the user clicking cancel. I think it's always a good idea to give the user the chance to change his or her mind. put it into field "text"
Unfortunately, this does not exactly result in the contents of the file being imported. Generally, if you want a whole document, the URL approach is the easiest way to get outside text sources into LiveCode. Therefore I use the URL keyword to get the content from the file path. URL's can be files on your hard disk as well as on some remote web server. to differentiate them, LiveCode needs me to specify a protocol, before the actual URL. As I am trying to import a text file, I use file: as my protocol. Other valid examples of protocols are binfile:, http:// or ftp://. put URL ("file:" & theFilePath) into field "text"
The above script now finally does what I set out to do. But I could just select any non-text file, and LiveCode would show its contents as text in the field. I do not want that. Beware: Sadly, the URL keyword is evaluated before the text combining keywords like &, && or , (comma). That is why I always have to use brackets when using the URL keyword, just as I did above. As a final step, I'll add a "with type" specification to the dialogue. As I only want text files, I'll restrict the dialogue to files that have "txt" as a suffix. 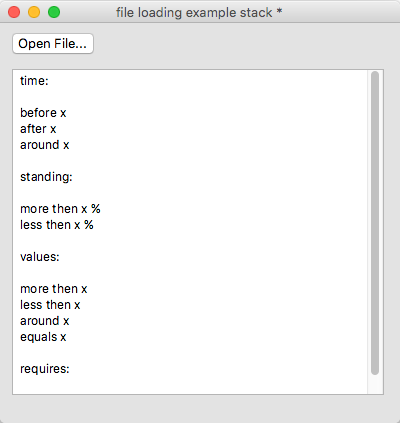 There's also an additional parameter, for the Macs file type ressource. Because I am on a Mac, I add the simple text descriptor "tTXT". If I'd ever want to select a file that does not meet my criteria, I also added the possibility to choose among all files, using * as a wildcard. This will add a little drop down to the file dialog, showing the two options I specified. Next: How Do I Process a Binary File? This example is very easy and usefull to understand. You teach to us thery well. I hope you write again codes like this to improve our programming skill. Great lesson and easy to understand for people new to revTalk (while showing off how a one-liner replaces 10 lines of C/Java code. An alternative to checking if 'it' is empty after an 'answer' or 'ask' command, is to check 'the result' and 'exit' the handler. answer file "Select a file"
This is a great tutorial. I really like how you step through the process gradually. One thing on the last step. I believe that with OS 10.6 the file type meta information is no longer available so tTXT won't work. Or am I confusing that with something else.? What changed with 10.6 is the policy. Previously the guidelines by Apple stated that one should use a suffix _and_ a Mac OS filetype. As of 10.6, the filetype is not mandated anymore. Of course many developers do not follow the guidelines by word, and many applications do never set any filetype (for example Apples own Text Edit). So I agree that in the mid to long term, the file type will most likely disappear. If platform is Windows then . . .
else if platform is Android then . . .
Would this be the correct syntax? else if the platform is "android"
answer "No rule to handle this platform" with "Okay"
Thank you! I used your syntax example and it works perfectly. This saves me from commenting out Windows every time I want to deploy to Android, and vice versa. Does livecode allow text files to be draged into the field and show the content of the text file in the field? and how? 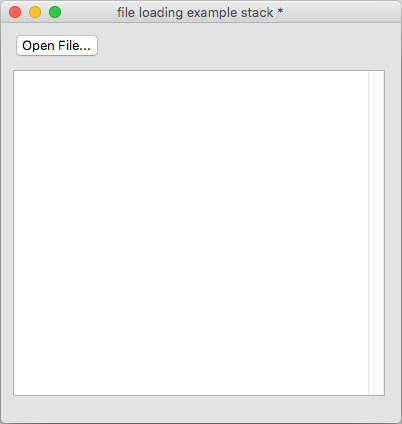 Yes, you can drag a file into a field and display the contents. Have a look at the dictionary entry dragData. May I ask if I can have number of text field depending on number of text files in a folder if I drarg drop a folder in a stack? 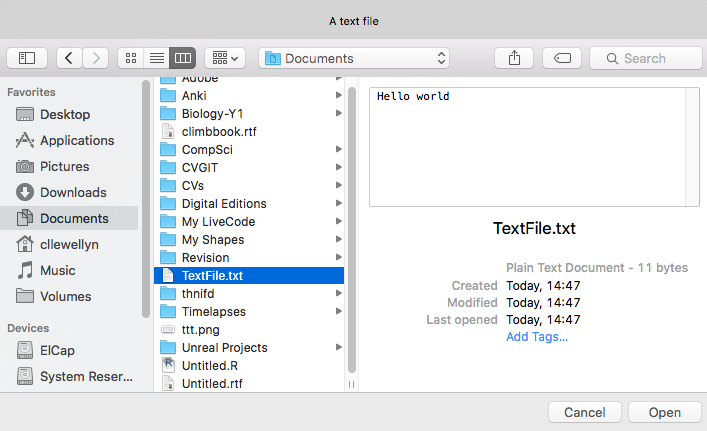 you can drag and drop a folder into a text field. Just like you drop a file as per my last comment. If you drop a folder, you will have to list all of the files in the folder, create a field for each file found and then open the files and write their content to the respective fields. You may also want to consider the position of the text fields when they are opened. This functionality will require a bit more code than I gave you in my last comment, but you can use much of the previous code to populate the field content. Thanks for the suggestion, I have had a look at the entries you asked, but I am afraid I need a little bit more help than that. For example how can I consider the position of the text fields when they are opened. what does that mean? Sorry I am very new to LiveCode and still struggling due to lack of proper time investment. Also just noticed that some of the files are pictures, meaning the folder is mix of text and some picture files. I dont think that the text field will be the right choice for pictures. How can I go about that? with position of the text fields, I referred to the location at which you may want to position the fields on the stack. Are you going to have a fixed number of text fields or are you going to have as many text fields opened as there are text files. You will then have to think about how you are going to managed these text field windows. set the fileName of the last image to "SOME FILE NAME"
I have not run the code listed here, but it should give you an idea of what you will need to implement the functionality. I think what you are looking for is the words chunk expression. This allows you to look at each word in a field in turn. Imagine you have 2 fields, one called "list" which contains your list of words and one called "user input", which the user enters text into. You could loop over the words of the "user input" field and check if they appear in the "list" field. This example assumes you have a button named "compare" which does the comparison when it is clicked. repeat for each word tWord in field "user input"
I hope that helps, there is a lesson explaining how to list all the unique words in a piece of text which might also help. I'm not so sure this is the correct place for this question. I'm building an Android application that reads from a text file that goes along with it. In the scripts I'm using relative paths to point to the file. In development mode it works perfectly, but when I save the standalone app, copy the apk file to my cell and install it on my Android device, it seems that the txt file doesn't come along. How could I make sure that the file will be copied along with the apk file on installation? Thank you for these tutorials and the answers to the comments. They are great! Thank you Elanor, I'll try it.